It’s Harvest time again after such a beautiful summer! Last week the children took a stroll down to the community orchard to help collect some of the huge varieties of apples. It’s a young orchard but it’s already given so much, and lovely that the children will grow along with the trees and get to learn so much from the very knowledgeable Chris and other members of the community here. Just before the half term break we were lucky enough to receive a special visit from the 'Zoolab' team. Our Pre-School children joined Reception class to experience some hands-on learning about some unusual mini-beasts, including Ruby the Corn Snake, Tilly the Tarantula (in her box!) and Gavin the Millipede! Not everybody was keen to touch, but everyone was intrigued and the children definitely learned some new things about creatures they might not otherwise come across. Thank you to Heather from Zoolab for a really interesting session. Last weekend we held our first Nature Trail event, and the weather was on our side! Our bug expert, Chris Spilling was on hand while the children searched for creepy crawlies, identifying them on their sheets and exploring in the orchard. They also got to try wildlife themed rubber stamping and tree bark rubbing. Thank you to everyone involved in organising a fun filled couple of hours in our great little piece of nature. A few jolly wonderful people (children and grown ups) came together at the beginning of this month for our regular tidy up of the Community Woodland Trail. We completed the wood chip covering of the winding path down to the allotments, weeded and strimmed and generally got it looking inviting, ready for the Pre-School Nature Trail event. In August, we sold cakes and biscuits at the Square & Compass Fair; parents, staff and Trustees produced a magnificent array of delights which raised over £400! 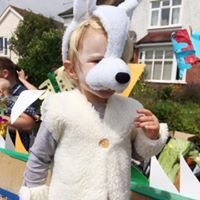 We entered a float into Swanage Carnival in July with the theme of World Animals. The children looked fantastic and we won the prize for the best float! our wonderful Pre-school has been saved from closure! Pre-schools all over the country are closing or under threat of closure because of Government underfunding. Working together with the community, we have saved our Pre-school and our future is looking bright. St George’s Pre-school had a cracker of a day at Putlake Christmas Market selling Christmas biscuits accompanied by a free cup of mulled cider. despite the fact that they ran out of cider at 4 o’clock! Once again the children in Pre-school decorated a Christmas Tree for the Purbeck Christmas Tree Festival at St James' Church, Kingston at the beginning of the festive season. The Festival raised a staggering £2,500 for a variety of worthy causes. In December, the Rat Pack donated their time and skills to play a gig at the King’s Arms, Langton Matravers. As usual, the band was in full festive form and at one point were accompanied by an audience kazoo orchestra that just didn’t want to stop. People were generous with their donations and the gig raised £120 For Pre-school. Many thanks to Ricky Lucas (the King’s Arms landlord) for his generosity and for letting us use the Pub. The theme of this year's Swanage Carnival was 'Great Britain' and St George's Pre-school decided to join in the fun on the top deck of an open-top bus. There were plenty of volunteers carrying buckets and the children danced to the very loud music of the float behind which just happened to be the visitors from the Notting Hill Carnival! 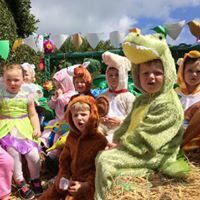 St George's Pre-school teamed up with Cygnets Pre-school at Swanage Primary School for a Swing Dance and Hog Roast in July. RP3 (Rat Pack 3) played and there was even a Lindy Hop workshop which got practically everyone up on their feet. Many thanks to all those who organised such a terrific evening. Many thanks also go to RP3 and the Lindy Hoppers. Pre-school ran a stall selling strawberries and ice cream/cream at St George's Primary School Sports Day in July. Fortunately, it was a hot day and business was brisk. We served over 75 people and made a profit of £66.50. At the beginning of term, Ruth and the Pre-school staff organised a sponsored trike ride for the children to raise money. Thanks to the generosity of the parents a massive £418.79 was raised! Thanks to everyone involved... next year we are entering the children for the British leg of the Tour de France! At Easter Paul & Lizzie Loudoun once again allowed us to go and see the lambs being born at Wilkswood Farm... a real Easter Saturday treat! The children enjoyed seeing the newly born lambs and many got a chance to cuddle one... carefully! Although it was a damp day day, mums, dads and children braved the weather to come to the Eggstravaganza. It was too wet to hold the Easter Egg hunt but the children still managed to have plenty of fun Trampolining etc. Everyone enjoyed the cakes and biscuits and at the end of the day we raised £135 for the Pre-school. Thanks once again to Vanessa for hosting the event and thanks to all the mums and children who made cakes. The Trattoria fundraiser in March was a great success. We raised £350 for the Pre-school and had a really enjoyable evening with great food and hospitality from Bruno and Ana. Many thanks to them for all their hard work.